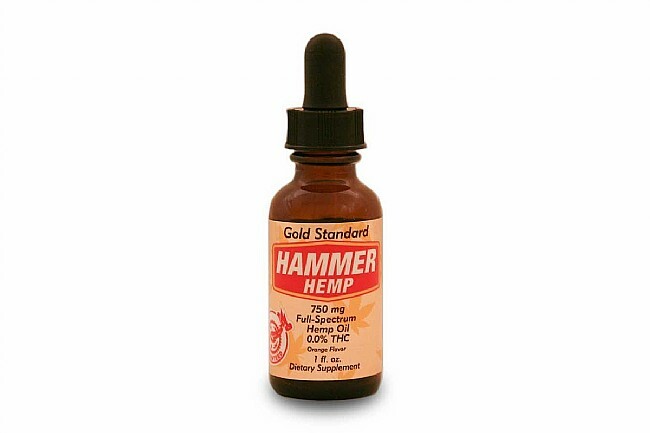 Hammer Nutrition's Hemp Tincture 750mg is derived from organic, non-GMO, USA-raised hemp. It’s 100% THC-free and legal in all 50 states. The proprietary extraction process and third-party batch testing ensure consistent and accurate levels of phytocannabinoids as well as purity of the product. Hammer guarantees that their hemp oil is everything you want and nothing you don’t—no heavy metals, solvents, microbes, or contaminants; just pure, bioavailable hemp oil blended with grapeseed oil and organic coconut oil for their healthy fatty acids: linoleic acid (omega-6), alpha-linolenic acid (omega-3)—in an ideal 3:1 ratio—and oleic acid (omega-9) that help aid in absorption. Its also pleasantly flavored with organic orange oil to ensure it tastes good. For best results, shake Hammer Hemp tincture well prior to use. Place one dropper full under the tongue and hold there for 60 seconds, then swallow. Please note that absorption rates are not equal to those in the nano-emulsified Hammer Hemp capsules and dosage may need to be increased accordingly.